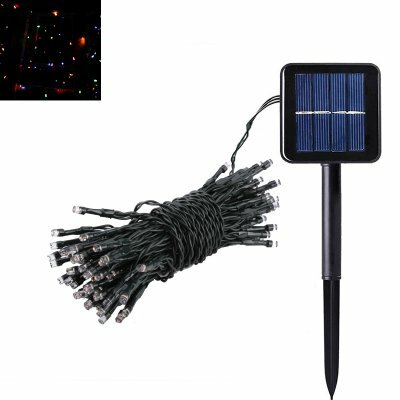 Successfully Added Decorative LED Light String - 100 Micro LED, 10 Meter, 2 Light Modes, 40,000 Hours Service Life, 4 Colors, Solar Powered, 400mAh to your Shopping Cart. Just in time for the holiday season, these beautiful Christmas LED lights are there to bring light and color into your life during the upcoming winter months. Perfect for decorating your outside Christmas tree or to be used to decorate the house or garden – these RGB LEDs are sure to bring along the Christmas spirit. With a length of 10 meters, this LED light string can be efficiently used to decorate a sufficient area. Whether you like to spice up your Christmas tree or add some colorful light around your living room window – with these LEDs you can’t go wrong. Featuring a total of 100 bright micro-LEDs, this string brings along an abundance of color and light. With its different colors and lighting modes, you can be assured that these Christmas lights are sure to set the right atmosphere in any occasion. Packing 25 red, 25 yellow, 25 blue, and 25 green LED lights, this light string is guaranteed to light up the neighborhood like never before. Coming with its own solar panel these colorful LED lights never run out of juice. Simply place the solar panel in your garden and you can be assured that there will always be enough power to light up your surroundings. Additionally, this LED decorative light string packs a 400mAh battery that, when fully charged, delivers multiple hours’ worth of energy – allowing these color lights to burn through the longest of winter nights, adding light and color into the lives of you and your neighbors. With a service life up to 40,000 hours, you can be assured that these colorful LEDs will light up your life for years to come. Besides being the perfect decoration for the upcoming holiday season, these colorful LEDs can also be perfectly used to spice up the interior of a bar, restaurant, or outside terrace. Thanks to its solar panel it will never run out of juice, allowing you, your friends, or your customers to enjoy stunning colors throughout the night. Nothing is better than enjoying a drink outside with your loved ones during a warm summer night, especially when your surroundings are lit and colored up with this beautiful LED decoration. Arabic: - سلسلة الصمام الخفيفة - Chinese Simplified: - LED 灯字符串 - Czech: - LED světlo řetězec - Dutch: - LED Light String - French: - Chaîne de lumière de LED - German: - LED-Licht-String - Hebrew: - נורית LED מחרוזת - Hindi: - एलईडी प्रकाश स्ट्रिंग - Hungarian: - LED-es húr - Italian: - Stringa di LED - Japanese: - LED ライトの文字列 - Korean: - LED 조명 문자열 - Malay: - Rentetan lampu LED - Norwegian Bokmål: - LED lys streng - Romanian: - Şir de lumina LED-uri - Russian: - Светодиодные строки - Spanish: - Cadena de luz LED - Thai: - สายไฟ LED - Turkish: - LED ışık dize - Vietnamese: - Đèn LED dây.